Touching down on Kaua'i, some people feel that they've arrived at a spiritual place, one of the planet's "power spots." 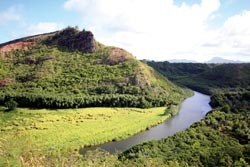 Whatever that might mean to you, you will be enchanted by Kaua'i: Ocean and sky, streams and rivers, forests and mountains will all embrace you as you find your own connection with the spirit of Kaua'i. Apart from Ni'ihau, Kaua'i is the oldest of the main Hawaiian Islands, having formed some five million years ago. Its majestic central peak, Mount Wai'ale'ale, was until recently renowned as the "wettest spot on Earth" (that title is now held by a bog on Maui), and the rainwater flows down its verdant faces to feed Kaua'i's five rivers. On a clear day, you can see Wai'ale'ale as you fly into Lihu'e, the Kaua'i County seat. This topography allows for only one highway, which hugs the coast and goes almost all the way around (except for the impassable Na Pali coast on the North Shore). From Lihu'e until it ends in the north, the road is called the Kuhio Highway. From Lihu'e until its end in the west, the road is called the Kaumuali'i Highway. The junction in Lihu'e where the name changes is at Rice Street is the main road leading to Kalapaki Bay and Nawiliwili Harbor. Because this major and only artery on Kaua'i is two lanes, be careful while driving: Don't make sudden stops or U-turns (drivers have died recently because they were attempting a U-turn) and expect traffic congestion. From the airport, you can go in one of two inviting directions: You can explore the East Shore and then head up to the North Shore, or you can head for the South Shore and then cruise out to the West Shore. Each area has its own natural and social environments, including special beaches, climates, vegetation, secret valleys, river mouths, waterfalls and hiking trails as well as dining, shopping, strolling and resorts. The East Shore runs from Lihu'e to the edge of Kapa'a town. It's the most densely populated part of the island and offers everything from shopping and dining to river valleys and ancient Hawaiian heiau (temples). From the airport you can see Ha'upu (also called "Hoary Head"), the massive, rounded peak that marks the southern edge of the East Shore. Kaua'i Community College is across Kaumuali'i Highway from it. Residents say that clouds on the top of Ha'upu forecast a short, refreshing rain. As you leave the airport, you can go one of three ways: Straight takes you into Lihu'e town, left leads to Nawiliwili Harbor and right goes to the North Shore. Lihu'e town was the first business center on the island and still serves as the civic and commercial heart of Kaua'i. Wilcox Hospital, the main post office, Kukui Grove Shopping Center and the main offices of several banks are here. Visit the Kaua'i Museum on Rice Street to learn about the history and culture of the Garden Island. After the museum, head to the Nawiliwili Harbor area. Here you'll find Kalapaki Beach, where locals and tourists mix for sun, swimming and surfing. Kalapaki is a good beginner's beach for surfers, and it's also a home base for several Hawaiian outrigger canoe paddling teams. A pleasant walkway hugs the beachfront here on resort property, and at the resort or nearby malls you'll find several places to dine or have a drink with a view of the bay. At the first left after Kalapaki on Hulemalu Road heading toward the harbor, the narrow winding road will take you up to Alekoko (Menehune) Fishpond outlook. Archaeologists estimate the fishpond was constructed about 1,000 years ago. Go back to Nawiliwili Road, turn left and you're a minute away from the Kukui Grove Shopping Center where you'll find national chain stores as well as many local businesses. As you leave Lihu'e heading east on Kuhio Highway, set your sights on the Wailua River. If you want to view Wailua Falls, turn mauka just past Wilcox Hospital where the highway dips. After passing through the old plantation town of Hanama'ulu back on Kuhio Highway, you'll soon see the Wailua Golf Course. Keep an eye out for the turn-off to Lydgate Beach Park, a well-maintained haven of grassy fields, pavilions, swimming areas, a playground and a segment of the coastal walk/bike path, which upon completion will be several miles long. The mouth of the Wailua River has been a sacred place since ancient times, not only for Hawaiians but for Polynesians in general. There are seven heiau beginning near the river mouth and going deep inland. These sites are still used for spiritual purposes and are protected by law; if you visit, please respect them by neither taking anything from them nor leaving anything behind. 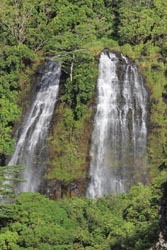 The Wailua area, though largely residential, provides opportunities to kayak or canoe up the Wailua river and view 'Opaeka'a Falls, which is on the right when you drive up Kuamo'o Road. Just across from the falls, a road winds steeply down to Kamokila Hawaiian Village, a replica of a native village. Farther up Kuamo'o Road between mile markers two and three, look for a trail on the right snaking to the top of "Sleeping Giant" (the profile of the mountain seen from Kapa'a town). It's an easy hike with a rewarding view. At the end of Kuamo'o Road is the Keahua Forestry Arboretum, a refuge for relaxing, hiking, swimming and simply enjoying Kaua'i's clean air. The resort property at the corner of Kuamo'o Road and Kuhio Highway was once the Coco Palms, Kaua'i's first resort hotel where Blue Hawaii was filmed. It was damaged by Hurricane 'Iniki in 1992, and its reconstruction remains in limbo. Across the highway from the hotel is Wailua Beach, where the water can either be very calm or rough and where there may be surfable waves depending on the time of year. Past the Coco Palms and Wailua Beach is another resort area and a famous coconut grove. Then you'll pass through the towns of Waipouli and Kapa'a, each with specialty restaurants, gift shops, grocery stores, cafés and a range of accommodations. You'll also find tour companies offering kayaking, snorkeling, zipline adventures and other activities such as movie location tours or lu'au. These once small and sleepy towns have undergone development in recent years, so be prepared for traffic congestion and general busy-ness. Where does the North Shore of Kaua'i begin? Some say it begins at Kealia Beach, which is popular with boogie-boarders and shortboard surfers. Something dramatic happens when you arrive in the area: The comparatively urban landscape gives way to ocean panoramas and mountain vistas, waterfalls and white sandy beaches, azure oceans, gentle mists and rainbows. Wherever the North Shore technically begins, it's the most lush and soothing area of Kaua'i. After Kealia you pass through Anahola. You won't see much of the ocean on the long stretch of highway between Anahola and Kilauea, but turn off the main road onto smaller side roads that head towards the ocean. Often a trailhead or a breathtaking view awaits. Kilauea, a former plantation town, is mainly a bedroom community today. 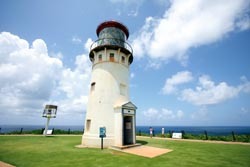 It's the site of the Kilauea Point National Wildlife Refuge, where you'll see a lighthouse built in 1913 that marks northernmost point of the main Hawaiian Islands and that once guided boats traveling to and from Asia. The view from the point is stunning and includes Moku'ae'ae Island bird sanctuary just offshore. If you're lucky, you might see dolphins frolicking and, in season, whales breaching. The refuge is home to native and migratory birds including albatrosses, terns, tropicbirds, boobies, nene and shearwaters. You might see endangered Hawaiian monk seals sunning on the rocks below. You can take a self-guided tour and birdwatch. Stop at the visitor center, where you can borrow a pair of binoculars. Between Kilauea and the Princeville resort development is 'Anini Beach, which is great for windsurfing, walking, picnicking, camping and playing in the large grassy park. On Sundays the polo club plays across from the beach playground. Camping here is popular with island families, particularly during long holiday weekends (a permit is required). Princeville, the next stop as you travel north, is upscale Kaua'i. It's a playground of posh hotels, condos and vacation homes set among world-class golf courses. Enter at the massive fountain makai of the highway. At the end of the road is the St. Regis Princeville hotel, which offers one of the best panoramic views of Hanalei Bay; the hotel's lanai is a great place to have a cocktail and watch an unforgettable Kaua'i sunset. The Hanalei Bay Resort Hotel offers another spectacular view. 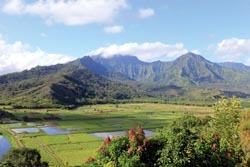 Before you drive down to Hanalei, you might want to view the valley from the outlook a few yards past the Princeville turnoff; it's a view that's included in every calendar collection featuring Kaua'i: fields planted in taro and the mountains beyond. The only way into Hanalei is via a one-lane bridge; when it rains excessively, the river overflows its banks and the bridge is closed. While the bottleneck causes traffic jams, the community has elected not to upgrade the bridge. The aim is to deter development in the valley; there's no way to truck in heavy loads of construction equipment and material over the current bridge. Hanalei is a welcoming and easygoing place. Green mountains and waterfalls run down the mountains, a stunning backdrop to the taro patches and conservation forest. Rain clouds often shroud the mountain peaks. Hanalei town has many restaurants, galleries and shops selling jewelry, clothing, glass and watersports gear. Several places rent kayaks, surfboards and boogie-boards. Head toward the ocean on almost any street, and you'll soon find Hanalei Bay. Behind the buildings fronting the mauka side of the main street are taro patches that have been tended by farming families for generations. Continuing north, you'll feel that you've entered an Eden. This is the "real" North Shore: one-lane bridges, beautiful beaches and forests. At Ha'ena Beach Park there's great snorkeling at a spot called Tunnels. Limahuli Garden and Preserve, which is a part of the National Tropical Botanical Garden, showcases native plants and demonstrates how native Hawaiians farmed taro in terraced ponds. At the end of the road is Ke'e Beach, one of the best snorkeling spots on the island and perhaps the most spectacular setting from which to watch the sunset. The eleven-mile Kalalau trail takes off at Ke'e; day hikers can reach Hanakapi'ai Beach in a couple of hours; add more time if you want to hike up the valley to the waterfall. Be careful about crossing the river at Hanakapi'ai; if it has rained in the back of the valley, flash floods can sweep away the unwary. Only seasoned hikers should attempt the Kalalau trail and only when the weather has been dry for several weeks. The trail has been maintained by volunteers who realized how dangerous it had become in parts. From various points along the trail, you can see the Na Pali coast unfolding, but if you want a panoramic view, boat tour companies make it possible to view the Na Pali coast from the ocean. You can also view it from the air by helicopter. Whichever way you do it, make it a point to experience the Na Pali coast, as it's one of the highlights of Kaua'i-if not in all of the Hawaiian Islands. Heading south on Kaumuali'i Highway from Lihu'e, the road is often lined by vegetation. Adding to this lushness are the invasive Hawaiian baby woodrose vines hanging from the trees and power lines. When the yellow blossoms dry they turn brown and are used for decoration. In some places along the highway there are different kinds of ginger. On both sides of the highway are acres of former sugar plantation land. Kaumuali'i Highway takes you to the South Shore area, where the sun is usually shining even when other parts of the island are overcast. Turn left off the highway at Maluhia Road ("tunnel of trees" road), and you come to the former plantation town of Koloa. The tree tunnel was created with eucalyptus planted a century ago by one of the island's plantation families, the McBrydes. Koloa was Kaua'i's first sugar plantation town and had its own sugar mill. After the sugar bust, the town suffered. It was restored to some of its former cozy charm, and it's being transformed again, this time to an upscale residential and resort area similar to neighboring Po'ipu, which is closer to the shoreline. Po'ipu is a major resort area boasting a luxury hotel with a golf course (where the PGA Grand Slam of Golf was held for several years), vacation condo "villages," a mix of resident-occupied homes and vacation rentals, shopping centers with good restaurants and a fine beach. Po'ipu Beach itself headed Dr. Beach's list of America's Best Recreational Beaches in 2001. Other beaches in the area are Brennecke and Shipwrecks. The latter fronts the hotel, and if you go past the resort the paved road ends. Turn onto a dusty, bumpy road to Maha'ulepu, which is a perfect area to spend a day walking the shoreline, hiking up Ha'upu and taking in the beauty of the cliffs and lava formations. Back in the populated area of Koloa, at the opposite end of the shoreline from Po'ipu, visit the Spouting Horn, which sends a plume of water into the air at frequent intervals. Back on Kaumuali'i Highway, you'll soon reach Kalaheo, another former plantation town now home to a public golf course and a mixture of middle and upscale residences. On the outskirts of Kalaheo, the landscape changes dramatically: Acres of former cane fields, coffee trees and open terrain mark the transition to the dry West Shore. The rain rarely reaches Kaua'i's West Shore, so it's drier, hotter and more barren than the rest of the island. You'll arrive first in Hanapepe, Kaua'i's "Biggest Little Town." As you approach, take the turnoff into historic Hanapepe, where you'll find a main street lined with art galleries. Friday night is art night, a good time to enjoy the galleries and shops. A stroll across the Hanapepe swinging bridge completes any daytime visit. At the edge of town turn left from Kaumuali'i onto Highway 543 and drive out to Salt Pond Beach Park, where there's an area of salt beds that are flooded by seawater from wells; after the water evaporates the salt is harvested by families who have made salt in this way for generations. This prized "Hawaiian salt" is available only from these families. Swimming at the beach is safe any time of year. Waimea town is the next stop. A twenty-seven-foot obelisk memorializes the death of Captain James Cook who landed on Kaua'i in 1778-his first landing in Hawai'i. The Waimea ("reddish water," from the red dirt of the area) River meets the ocean at Waimea. (Swimming isn't recommended due to the runoff.) While in Waimea, you might want to taste one of the local specialties, including poke (pronounced "poh-kay"), a dish made with chunks of raw fish or other seafood (including octopus) and seasoned with seaweed and spices. Try it! It's one of Kaua'i's delicacies. From Waimea, you can either drive farther along the highway to Kekaha and Polihale or go mauka on Waimea Canyon Road. If you decide to go out to Polihale State Park, also called Barking Sands for the sound of the shorebreak, you'll first drive through Kekaha, where the road runs along the beach-it's a starkly beautiful area. At the Polihale turnoff, be prepared for a long, bumpy, and totally worth-it drive on a dirt road that leads to a pristine beach and views of the westernmost cliffs of the Na Pali coast. The beach is wide and long, running for seventeen miles from Polihale cliffs back down to Waimea. Swimming here is risky, so be careful. The shorebreak can be quite rough, and there are no lifeguards or facilities. If you choose Waimea Canyon Road, be prepared to have your mind blown. Known as "the Grand Canyon of the Pacific," Waimea Canyon was formed by successive lava flows. The layering of the rock creates striations reminiscent of the Grand Canyon. As you drive up the road, more of the canyon comes into view. You'll soon enter Koke'e State Park, where you can take advantage of the lookout points and trails overlooking the Na Pali coast. On your way into the park visit the Koke'e Museum for maps and displays about native and introduced plants and animals. You can't end a tour of Kaua'i without visiting its crowning glory: Kalalau Valley seen from the Kalalau Lookout. You'll view the valley from above (the only other vantage is from within the valley itself, accessible only to those who hike the Kalalau trail or boat in). There are no words for the beauty of this spot-it's unforgettable, just like Kaua'i itself. If the valley is shrouded in mist when you arrive, don't despair and don't leave. After a few minutes, when the mists part and the rays of sun touch the valley, you will experience something magical.